When we speak of the cutting force, we refer to the necessary force that we have to exert to cut and profile a CNC machining part. This force also intervenes in fundamental aspects to obtain an optimum result in the CNC machining, as the increase of the temperature of the part and of the tool, as well as the wear of the tool, the superficial and dimensional quality of the piece, the clamps Used for fastening and tooling, etc. The interaction between the part, the tool and the chip resulting from the CNC machining, is equivalent to a whole series of pressures on the tool, in this way, the system of shear forces, friction and the pressure exerted on the part, allows us Calculate the energy needed to machine the piece depending on the material of the same. This energy is known as specific shear energy, which translates into the energy we need to remove a specific unit from the volume of the part. 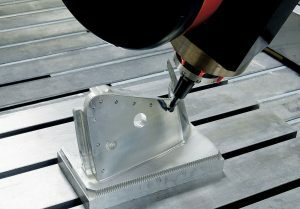 But not only is it useful for us to know the power we need in the machine tool, but it allows us to know the speed of manufacture and the thickness of the chip. The lower the cutting speed, the higher the cutting energy, the higher the speed we get to a stable value that remains constant piece by piece. In all CNC machining operations in addition to the cutting force, the friction force intervenes, although it does not behave as it should in other processes and is due to the metal surface of the part. The metal surfaces of the parts in normal state, contain a layer of oxide that overlays the atoms of the metal, this layer protects the material from possible subsequent oxidations. When cutting and profiling these parts, the pressure exerted is low due to this oxide layer, resulting in weak contact between the part and the tool, a factor to be taken into account when we want to do a CNC machining of these characteristics. Conversely, when the contact between the two surfaces is rough, such as welded parts, the pressure is somewhat higher and hence the frictional force as well. When these factors are not taken into account, the frictional force can become total, making the work and sliding of the work difficult.